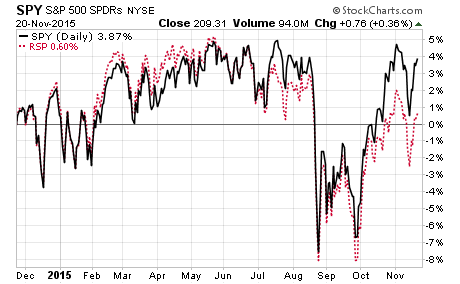 Breadth tends to tell you where you are going in a market. 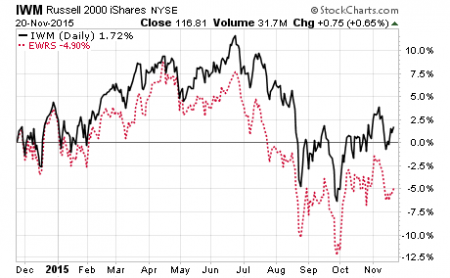 Breadth is sending negative signals. The direction of breadth has diverged from the direction of the market-cap weighted indexes (indexes dominated by a few giant stocks, like Apple and Exxon) creating the negative warning signal. 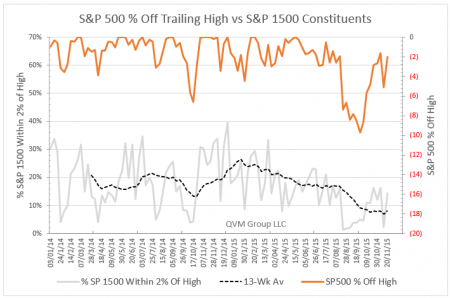 Breadth is moving down and the market-cap indexes are mostly flat for the year, with a recent strong rally from a short-term correction — but the indexes have still been unable to exceed their mid-year highs. Breadth may be the Grinch that steals the Christmas rally. 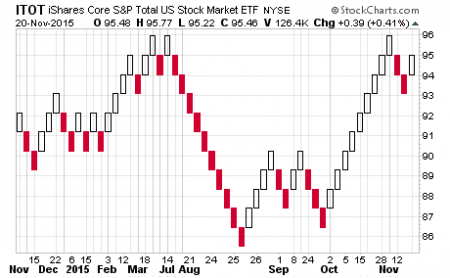 These charts show the deteriorating underpinnings of the US stock market. 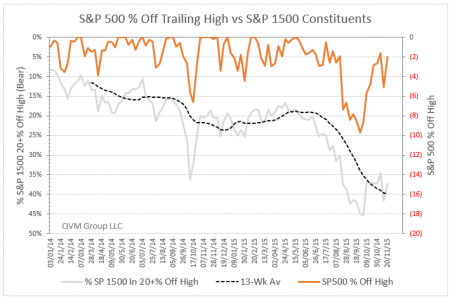 Each chart shows the distance of the S&P 500 price from its trailing 1 year high in orange (using right scale); and a parameter of breadth of the S&P 1500 (large-cap, mid-cap and small-cap combined) in gray for the end-of-week value, and in dashed black for the 13-week average (3 months) of that weekly value (using left scale). 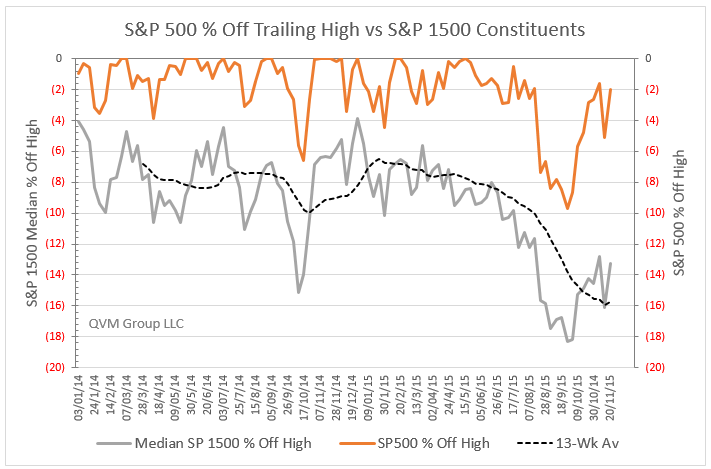 This first chart shows the distance of the median S&P 1500 stock from its trailing 1 year high. You can see in the orange line that the S&P 500 had its Correction in August, but that the median S&P 1500 stock began its slide from its trailing 1 year high near the beginning of the year, giving a warning. The median has recovered somewhat on a weekly basis, but is still declining of a 13-week basis. The median stock is off its 1-year trailing high by more than 13% as of Friday, and about 16% on a 13-week average basis. This compares to the S&P 500 index being off a bit less than 2% from its trailing high. At the end of 2014, the median stock was down only 4% on that Friday, and 8% on a 13-week basis — a lot better than the 13% and 16% now. The median stock was also off its high by 4% at the beginning of 2014. Much damage has been incurred this year. This is an important divergence. 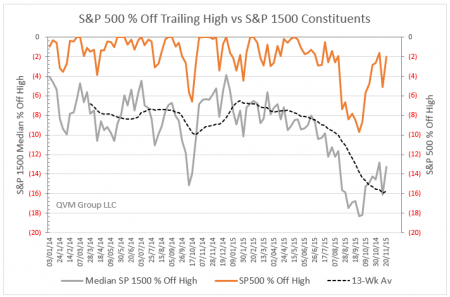 The median is falling while the market-cap weighted index dominated by the giant companies is essentially flat and attempting to reach prior highs. How long can the giant companies do well if many smaller companies do not? Generally the answer is not too long. Let’s look at some other breath time series. 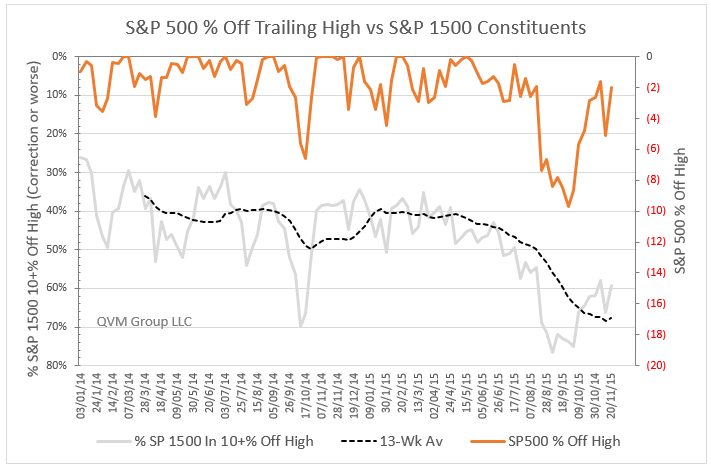 This chart tracks the percentage of S&P 1500 stocks that are within 2% of their trailing 1 year high. 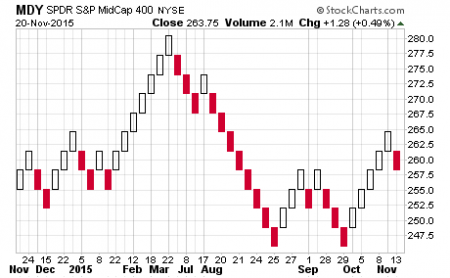 That too began to slide downward months before the S&P 500 Correction, and continues its downward slide. The weekly value has risen from its correction low, but is proportionately still in a much weaker recovery than the S&P 500. This is an important negative divergence and warning signal. 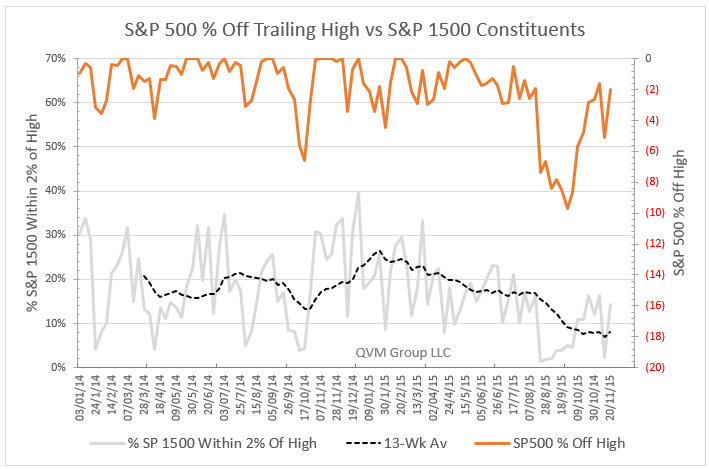 Approximately 15% of the S&P 1500 are within 2% of their trialing high, and about 8% are that close on a trailing 13-week basis, but that compares to approximately 40% and 23% at the end of 2014. That’s a large deterioration for the top end performers. Now let’s look at the weak performers — those in a Corrector or worse (10% or more below their 1-year trailing high). The S&P 500 is well out of Correction territory, but a majority of the stocks in the S&P 1500 are not, as this chart shows — note the gray and dashed black lines are using an inverted scale to more clearly show the divergence. That charting method makes the plot turn down as the number of stocks in Correction goes up (condition goes worse). 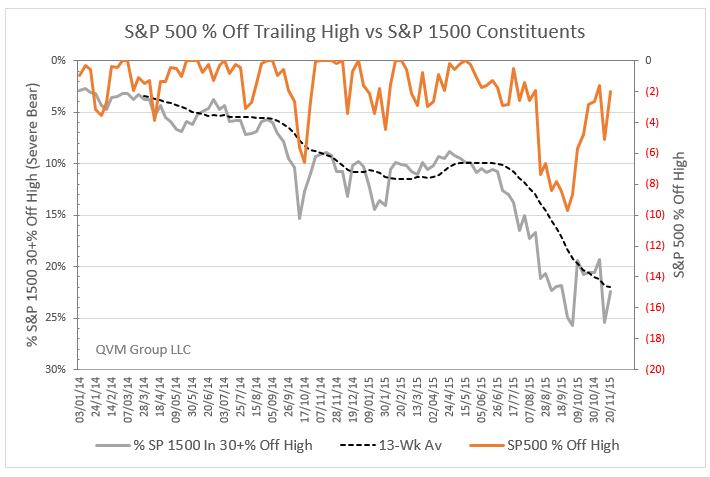 Fully 60% of the S&P 1500 stocks are down 10% or more from their highs, and 68% are down that much on a 13-week average basis. At the end of 2014, the numbers were 34% and 45%; and only 25% on the first Friday of 21014. Once again, we see a big deterioration. And, simply on the face of it; well more than half of the S&P 1500 in still in Correction. That is not encouraging for the giant companies, that can only outpace the pack by so much for so long, after which their performances must come closer together — either by the pack catching up or the leaders coming down. What about those in Bear or worse territory (down 20% or more)? That doesn’t look so good either. Currently 37% are in a Bear or worse as of last Friday, and 40% are in that condition on a 13-week average basis. That compares to only 19% and 23% at the end of 2014; and only 8% on the first Friday of 2014. This chart uses an inverted left scale like the last chart to show negative conditions by a downward plot. That Bear statistic did not give forewarning, as the median and 2% off of high and Correction statistics did, but it is giving warning now that the situation is not getting better under the surface of the S&P 1500; and by indirection that is a bad sign for the near future of the S&P 500. Now let’s look at stocks in really tough shape — those down 30% or more from their trailing 1-year highs. That is an ugly chart too. This also uses an inverted left scale. 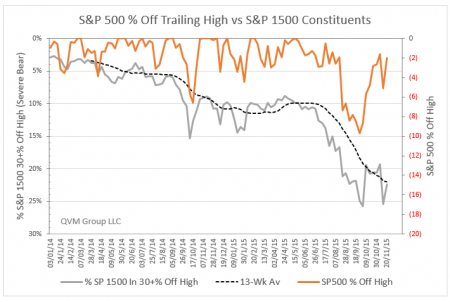 At the beginning of 2014, only 3% of the S&P 1500 stocks were in a Severe Bear condition (below their trailing 1-year high by 30% or more). By the end of 2014, that number had risen to 10% on an end-of-week basis, and 11% on a 13-week average basis. However, now the statistic is 23% as of last Friday, and 22% on a 13-week average basis. That’s a serious deterioration. 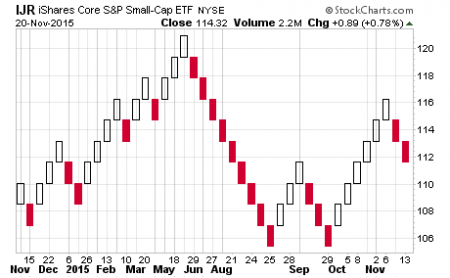 The bottom line is that below the surface of the market-cap weighted indexes — the indexes the daily business reports publish — there is a deeply troubling breakdown. 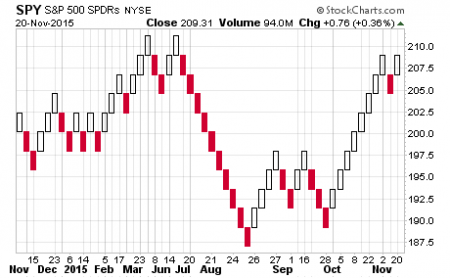 The majority of stocks are not doing anywhere near as well at the giant stocks, and many are doing just terribly. This divergence must resolve – it always does. The top can come down or the bottom can come up, but the performance gap is too large and growing to be sustained long-term. There is a possibility of, and perhaps an historical tendency for, a Christmas rally in the market-cap indexes, but we see the distinct possibility to probability of the Grinch stealing Christmas. As a consequence we continue to hold above average cash positions, but are nibbling on high quality, low volatility, value oriented, above average yield, consistent dividend paying domestic stocks with strong brand equity, and believably sustainable businesses, that have been around long enough to have proven they can weather strong storms. Here are some noise canceling charts of the S&P 1500, and its three components indexes, the S&P 500 large-caps, S&P 400 mid-caps and S&P 600 small-caps that show in their own way that the smaller market-cap weighted stocks are well behind the large-cap stocks. The charts cancel “noise” by only plotting a change in price when it moves by more than a certain amount (the 14-day average true range in this case). They do not plot time on the horizontal, just new equal size “boxes” for each incremental price change greater than the selected amount (the 14-day average true range). A second traditional set of charts plots the market-weighted version and equal weighted version of the S&P 500 and of the Russell 2000 small-caps, to further show that the bulk of stocks in the major indexes are falling behind the larger members to dominate the index quotes you see and hear on TV and radio and read in the business press. Both the S&P 500 and the S&P 1500 are massively dominated by a handful of mega-cap companies such as Apple and Exxon. As a result they have similar performance. This entry was posted on Monday, November 23rd, 2015 at 2:45 AM and is filed under market outlook. You can follow any responses to this entry through the RSS 2.0 feed. Both comments and pings are currently closed.